Shopping for a little boy can be hard. Clothing wise, there is just so much more for little girls. Toy wise, there are so many electronic things now that it can be hard to separate from it. 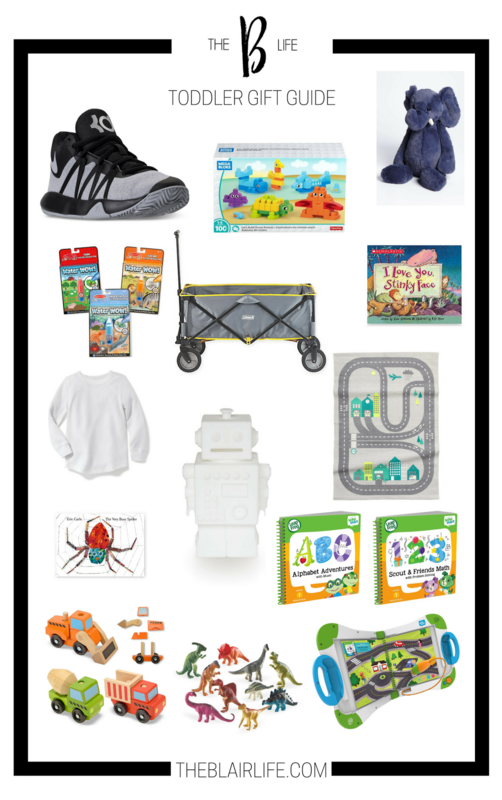 For Leighton's Christmas presents this year, we wanted to stick to educational things, toys and animals that he really loves, books and clothes. We didn't quite hit the 4 present - want, need, wear, read - ideal, but each of the things we got him fall in one of those categories. Of all the stuff we got him, we only have one electronic (technically) item, but it is something that he is going to be able to grow with and use in the car on our trips. 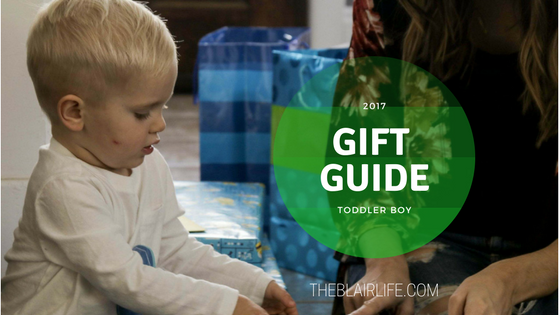 This gift guide is a mix of things we actually got, things our family gifted or things we thought about getting for Leighton this year. This kid is in love with elephants. It only seemed fitting he had one to snuggle. He has a fleece zip up from last year, but it is time to size up. These blocks are so fun and help him work on stacking/patience. Lately we have been noticing him playing with toys more often and making them interact. It is time for some animals to play and move around. Plus his dinosaur impression is pretty cute. We already have one of these and he has used it to the point that the pages are starting to not work well. The fact that it uses water and is ready to use again once the page is dry makes it perfect for traveling. There are never enough socks. With a second babe on the way, I am looking forward to short walks to the park. It seems fitting that we have a wagon to help with the trip. In Leighton's big boy room, I envision a road rug. This one is simple but still fun. We are moving to the big boy room after Christmas. In that room is a regular twin bed that sits pretty high off the floor. L is a very good sleeper, but he moves ALL OVER. Gotta keep the kid safe! Like socks, there are never enough books. I am so thankful that L loves to read. We kept meaning to get him a piggy bank and this Christmas it is finally happening. We travel to visit family a lot. Having things for him to use in the car is key. This Leap Start will allow him to be independent and "read" to himself in the car. Plus is give us a break from Paw Patrol, Trolls and Boss Baby on the iPad. Obviously we need more than one book for the Leap Start. Every year (okay so the last two years) I get L some new Christmas PJs. It is a tradition I want to establish for our family. They go in his stocking! Toddlers are always growing, therefore the need for clothes is always there. If their bodies are growing, so are their feet! Thanks for stopping in! Make sure to keep an eye out on Instagram, Snapchat (katianne1519) or Facebook for updates on my next blog post and for our daily updates!